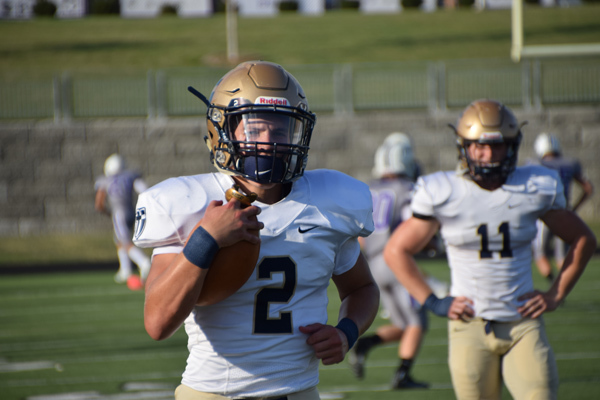 It was a busy night at the Blue Valley District Athletic Complex on Thursday September 17 as the Saint Thomas Aquinas Saints simultaneously faced off against the Blue Valley Northwest Huskies in football and soccer. While the soccer team hung on for a 4-3 win the football team cruised to a 42 – 13 score. After forcing a three and out on the Huskies first possession, Aquinas put together a seven play 53 yard drive to take a 7-0 lead. The drive was highlighted by a 28 yard screen pass to 5’7” senior running back Jacob Leikam who caught the ball in space and ran down the right sideline before being brought down at the BVNW 20. Aquinas’ defense continued its first half onslaught as they forced the Huskies to punt on their first five possessions of the half. The halftime whistle was the only other thing to end a BVNW drive. Senior quarterback Karter Odermann had the Saints offense rolling all night. Odermann led four straight first half touchdown drives all scored by different Saints running backs. The backfield wealth fits Coach Dreiling’s run first system, but he still wants to try and work the passing game as well. It only took the Saints four plays to move 69 yards to score their fifth touchdown of the game. Senior wide receiver Duron Lowe capped of the drive with a 10 yard sweep off the right side. Lowe would score on the STA’s next possession as well. This time he took a handoff from back up sophomore quarterback Will Swanson around the right side. He broke a tackle at the line of scrimmage and out ran the Huskies 25 yards to pay dirt. That would be the last score of the game for the Saints as they played their backups most of the second half. Near the end of the third quarter BVNW would finally get on the scoreboard. After an Aquinas punt senior quarterback Jack Knutson took the snap and took his five step drop. He looked to his left and arced a perfect pass to senior wide receiver Gabe Jones. Jones caught the ball on the left sideline just across the 50 yard line; then he broke away from two Saints defenders running nearly across the whole field before scoring near the right pylon. The Huskies would add another touchdown before the end of the game, and they worked hard until the final whistle. Next week Northwest takes on Blue Valley North, and the Saints travel to Bishop Miege.